FIRST OF ALL: shout out to my next potluck, happening in late January. See all the details here. Moving on: I was going to title this recipe "A Post-Workout Smoothie" because I made it after the gym today and it tasted amazing, but then remembered that basically any smoothie is good for post-workout fuel, and good anytime at all. Smoothies are generally just a bunch of fruit and other good stuff so no matter what you're doing, planning on doing, or just did: it's PROBABLY a decent time to make and drink one. In this case we've got your basic miracle foods. Berries are superstars. Bananas are delicious and make the smoothie creamy. Chia seeds are great for fibre. Ginger is winning at life. And kiwis are cute. 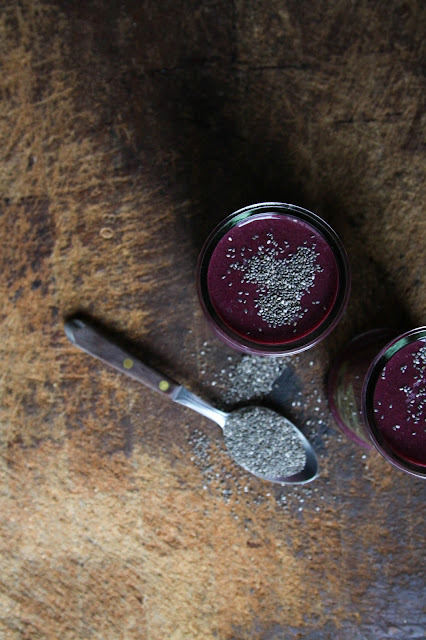 Whirl 'em all up in your blender and you have just created an energy elixir that will make you feel good from the inside out. I like eating foods that do me favours (such as lengthening my life span, keeping my organs functioning optimally, and giving me the nutrition I need to get through my day in a happy mood). Having said that, there is so much vegan junk food available to me now in Vancouver that sometimes it's really hard for me to stay in my healthy diet lane. Over the past couple months Jack and I have gotten into some routines that temporarily feel great but over the long term wind up makin me feel sluggish and unmotivated. I'm talkin about late night runs to the vegan pizza place, drivin to the grocery store purely for coconut ice cream and pumpkin cookies, and lots and lots of steamed buns made with white flour from T&T. Oh wait: and donuts from Cartems. All these foods taste SO GOOD in the moment and I've been making a point to not restrict myself to them (to continue healing my mind from a history of disordered eating). Simultaneously as these foods are good for me mentally, over time they make me feel like crap. Then I skip a day at the gym and start sleeping in in the morning and by time evening rolls around and Jack is saying: "Let's get pizzzaaa!" I realize I really want to [again] as well, then veg out on the couch with X-Files and some herbal medicine. This has been the past few months pour moi. Well, this isn't a big deal. I've been eatin' lots of junk lately and that is 100% OK. If I wanted to continue doing this, there'd be nothing wrong with that. But in fact I'm fed up with feeling groggy and uninspired most days so I'm focusing my brain on getting back into healthy habits: hittin up the gym every day and drinking lots of fruits and veggies in the form of smoothies. Ultimately, life's too short to obsess over this stuff or self-shame about it. I aim to enjoy myself in whatever ways I can while I am here, whether that be pizza binges or smoothie love. 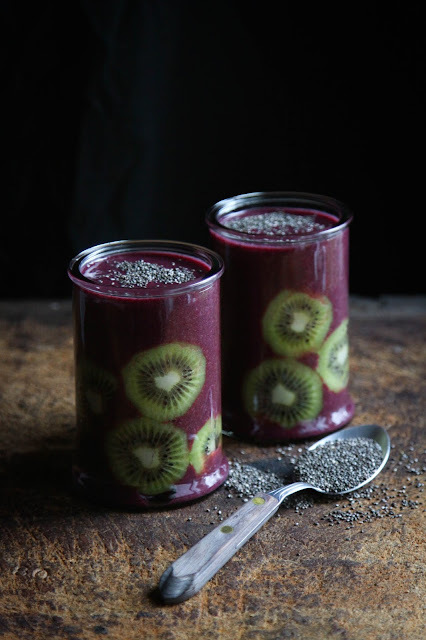 Blend everything except the kiwi until smooth, adding almond milk as needed to get the consistency you like. 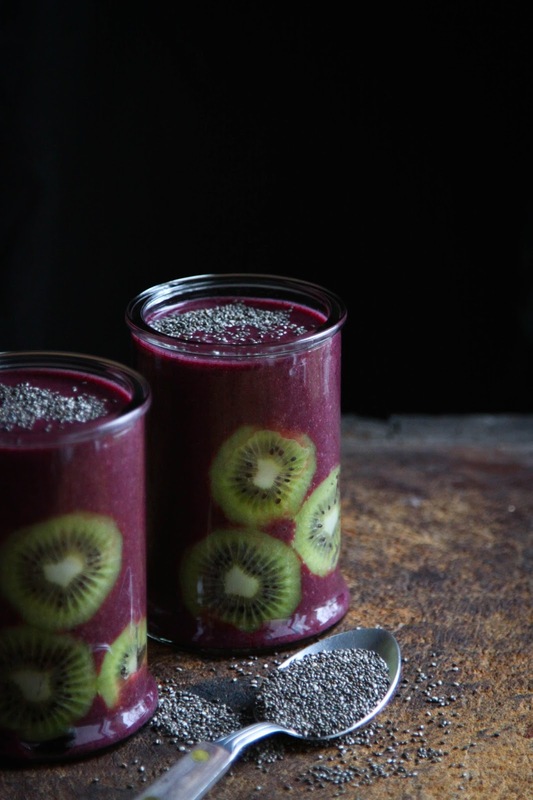 Peel the kiwi and slice it; gently place these along the inside of a couple glasses and then pour in the smoothie. Garnish with some extra chai seeds if you like. Enjoy!